Marketing Series Part 5 – Customer Relations - A Digital Marketing Agency | IIAS - International Internet Advertising Services Inc. The term “Customer Relations” pretty much says what it means – it’s how you interact with your customers and the quality of the relationship that forms as a result. The secret here is viewing your customers as friends. That means listening as well as talking, being fair, staying in touch, living up to your good reputation, and not taking advantage. If you are good to them, your friends will support you, and not just in terms of sales. Here are three principles to guide your Customer Relations policies and procedures. If you think of every sales opportunity as an opportunity to get to know your friend better, you’ll be helping them as well as yourself. In a store (or office or home, if you provide a service), this means having staff to ask questions, explain options, and ensure that the purchase is an exact match to what the customer wants. 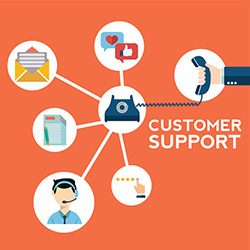 While many websites now offer live chat services to help customers in a similar manner, that’s not necessary if you provide a good search tool and sufficient information about your products or services. The decision process for purchasing includes the evaluation of alternatives, and this is where you need to ensure that the information you provide addresses the evaluation criteria. These criteria vary based on the product or service, but will include things like price, delivery time, and features. There’s a more complete list on the Customer Relations Worksheet. Now remember, whether selling online or in person, you are selling to a friend. If you try to deceive them, charge a ridiculously high price, or pressure them into buying something that isn’t what they really want, they are going to avoid you in the future. A sale is an agreement, and between friends that’s taken at face value. If you make a deal with a friend, and then squirm out of it with “fine print,” they aren’t likely to make another deal with you. Customer Relations 4If you were completely honest at the time of the sale, and the item or service was delivered on time and as promised, you’ve made a good start at meeting their expectations, but you can’t stop there. One of the most frequently overlooked and poorly executed deliverable with a product or service is instructions. The highest quality item can turn quickly into a return if the customer can’t assemble or use it in the way they wanted. In fact, the quality of the instructions is equally important to the quality of the item. While printed instructions are appreciated, all you really need to do these days is provide a website address where text in different languages, images, and videos can be accessed. Learn more on the Worksheet. Following up after a sale is one of the easiest and most efficient ways to foster future sales. There are four key messages you want to include. First, a thank you. Second, an incentive for a subsequent purchase. Third, a request for feedback; and finally, an invitation to stay in touch. The “thank you” note is an effective way to reinforce your brand. The incentive can be a discount coupon or invitation to join an exclusive group that’s notified of special sales. This also reinforces your brand and encourages customers to follow you in some manner so they can take advantage of the discount. The request for feedback is important because you want to be the first to hear if the customer is unhappy. Provide a phone number or email address, as well as a form on your website, and resolve the problem quickly and to the complete satisfaction of the customer. If the feedback is positive, you can ask to use it in your marketing efforts. Be sure to acknowledge, and pay attention, to any suggestions your customers make. Maybe they’re not unhappy, but simply want to share an idea they think is helpful. This free advice should not be overlooked, and warrants another thank you. The invitation to stay in touch should offer active and passive options. An active option is one that you control, such as sending an email. A passive option is one that the customer controls, such as following you on Twitter. In either case, don’t abuse this opportunity. Set a theme, such as new items, and a reasonable frequency – weekly at most – and only vary from that on rare occasion, like a super discount sale. For more ideas on ways to follow up, have a look at our Customer Relations Worksheet.